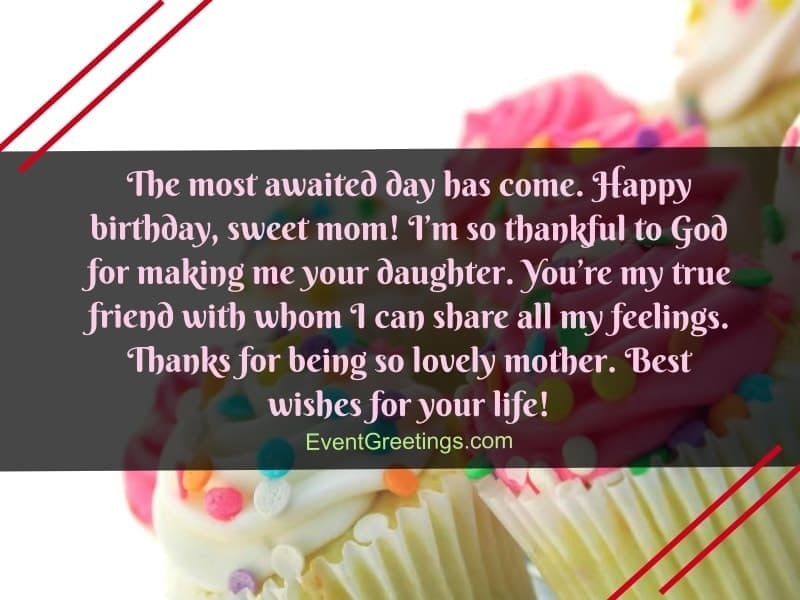 Go beyond the bare minimum for your mother’s birthday celebrations today by writing down your own unique wish for her on her birthday card. It’s time to get rid of store-bought birthday cards and wishes, and write in your own style instead! 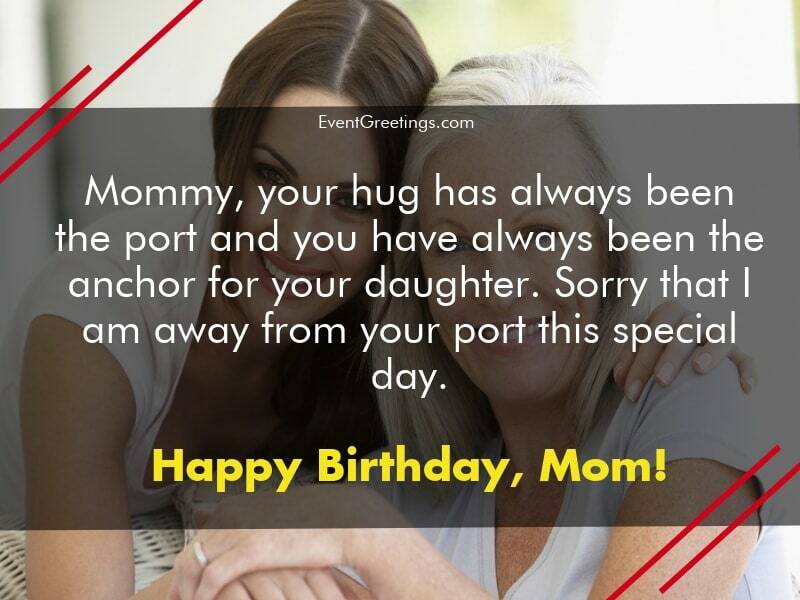 Not sure what to include in the meaningful birthday messages meant for your mum? 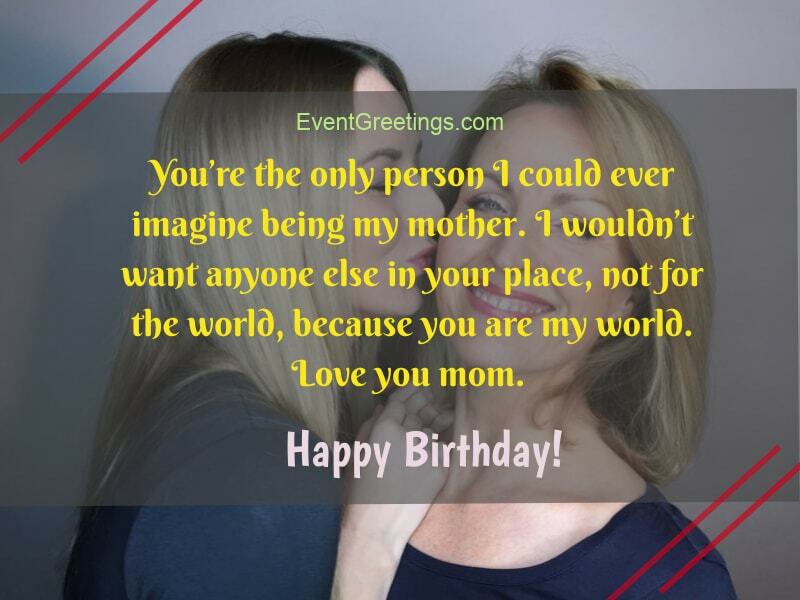 Take a look at what we can provide you here and include your favorite birthday wish for your mother with a touch that only her daughter can provide on her card this year. am away from your port this special day. Happy birthday,Mom! 2. You are the one who stays out late for me every day, worry about my worries every night. I can’t find the words to describe the presence of life you gave me. Happy birthday my mother! 3. I want to happy, healthy and strong to watch me grow and gain more and more time together. Happy birthday my dear Mom! 4. You’ve always been the guide in my life, the path in my roads, making sure that I’m not taking the wrong way. For these reasons, and at least one hundred more, I love you. Happy birthday! 5. They say that relationship between mother and daughter is difficult and complicated. I say it’s unique. Happy birthday mum! 6. I always remember you say that you are growing older every year. No mommy, you are not growing older. We just steal more time together. Happy birthday Mom! 7. Every year the same question. What is the most fabulous present for the woman who gave me birth, has grown me up? The answer is always simple. There is no present that can reflect the gifts you gave to me. There is no present to reflect the love I feel for you. Happy birthday! 8. Every second that I breath, you do your best for me, just to see me smile. I owe you my happiness. Happy birthday mum! 9. Today is your day! And I wish we could just lounge on the sofa and watch movies together like the old good times. You can’t imagine how much I miss you. Happy birthday mum! 10. You are the touch in my pain, you are the cure in my heart. I feel peace in your hug and I can’t wait to see you grow older with me. Happy birthday my idol! 11. You gave me the miracle of life. Every time you cry , just remember these words. They are not said just for today. They will be said for a lifetime. Happy birthday mom! 12. All these years, you give the right rhythm to my movements. You are my guardian. Happy birthday mom! Your daughter. 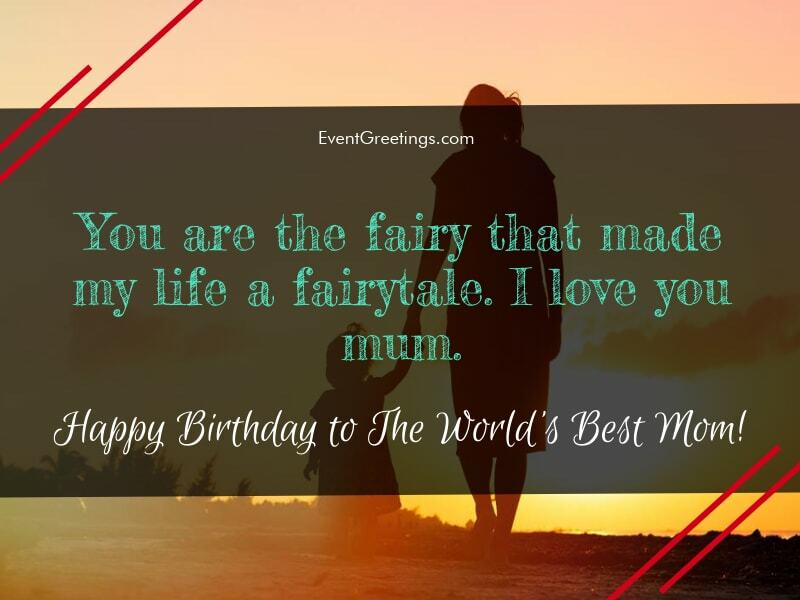 Happy birthday World’s best mum! 14. You are the friend, the idol, the courage, the road, the light. You are my mommy. Happy birthday! 15. Today, I just want to hug you, kiss you, feel the warm of your hug and the beat of your heart. For all the time you carried me, I will carry you in my heart. Happy birthday! 16. Roses are beautiful when they are grown. Happy birthday mum! 17. You are the fairy that made my life a fairytale. I love you mum. Happy birthday! 18. You know that I love you. You hear my voice in the silence. Happy birthday mom! 19. You are growing older, yes, but don’t worry mum. You’ ll always be my best mate. 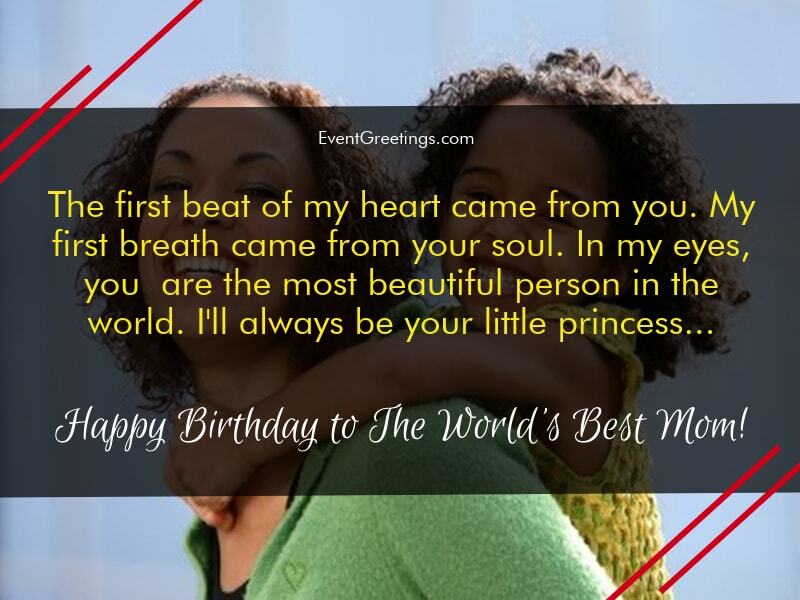 Happy birthday mother from your little daughter! 20. I have a kiss and I don’t know where to keep it for not getting lost. Is there any better place than your cheek? Happy birthday mum! 21. My Unforgettable Miracle. My mum! Happy birthday! 22. The first beat of my heart came from you. My first breath came from your soul. In my eyes, you are the most beautiful person in the world. I’ll always be your little princess… Happy birthday mom! 23. When I run, you run with me. When I hide, you are the only one knows where I am, always waiting for me with a hug and a kiss. Today is my turn for hugs and kisses. Happy birthday mom! 26. 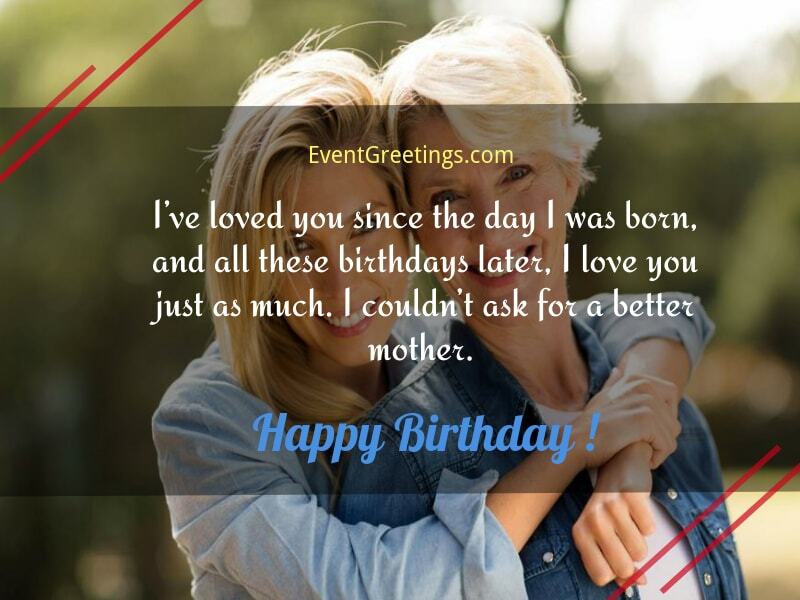 Mom, please enjoy your special day. Take care, rest, laugh, and hug, because you deserve to celebrate on your birthday. Happy birthday! 27. 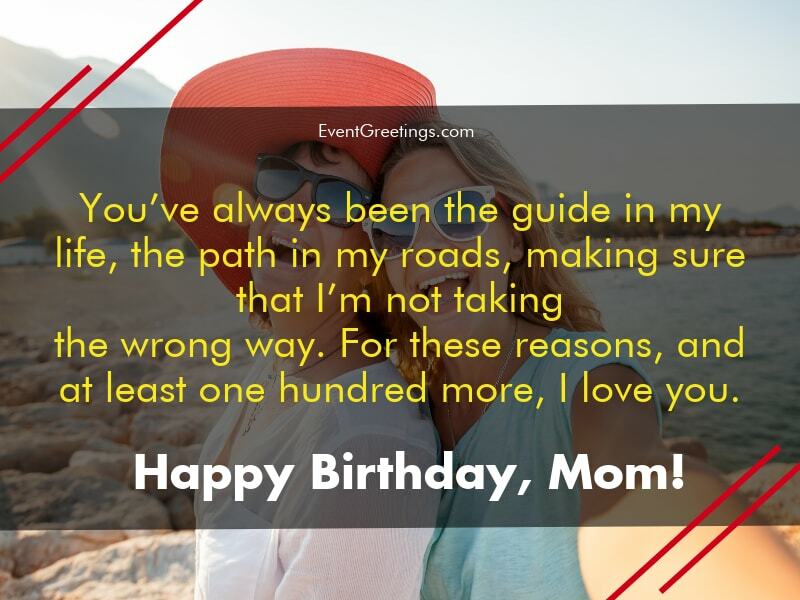 Mom, I hope you enjoy your birthday and spend the day laughing and smiling. You deserve it. Happy birthday! 28. You’re the only person I could ever imagine being my mother. I wouldn’t want anyone else in your place, not for the world, because you are my world. Love you mom. Happy birthday! 29. You’re the most perfect mother to ever walk this Earth. You’re smart, kind, beautiful, and courageous. The perfect woman, and the greatest mother. Happy birthday! 30. I could give you flowers, jewelry, money, and clothes, but that won’t tell you how much I love you. So I’ll do it now. Mom, you’re my best friend, my angel, and my first true love. You’re the best person in my life and I always want you by my side. Happy birthday! 31. Today is the day to celebrate how lovely you are. You’re a great mom who’s always done so much for me, so I want you to have a great day today. Happy birthday! 32. The bond between mother and daughter is like no other bond. You’ve taught me so much, and I can only hope I become the woman you are one day. Happy birthday! 33. I’ve loved you since the day I was born, and all these birthdays later, I love you just as much. I couldn’t ask for a better mother. Happy birthday Mom! 34. This is the day to laugh and celebrate. 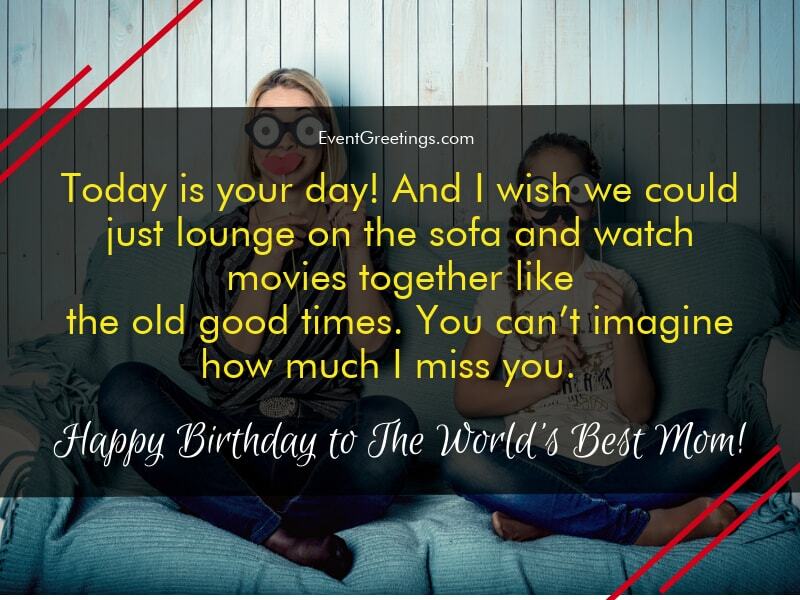 You’re with us and we’re so happy, and we want to celebrate many more birthdays with you. Happy birthday! 35. To a mom who has given her children so much, I say thank you. A thank you isn’t enough, nor is a kiss and hug. But I hope you know how much I love you, and how much I appreciate you. Happy birthday! Moms are great. The efforts that they put into raising their children are just as great too, if not more. As such, it’s totally understandable to feel as if there is no way that we can ever fully repay our own parents for their love and care. Sure, there’s always handmade gifts & cakes to be gifted on Mother’s Day, and lots of hugs peppered through the days and weeks. However, like all mothers, sometimes it’s the kind words and gestures from their own beloved daughters that they yearn for. 36. Every great child was brought up by a wonderful, caring mother. Please know you did such a good job at raising me, teaching me, and loving me. Happy birthday! 37. To a mom who has taught me so much. Where do I begin? How do I express my love and gratitude for you? I don’t know if I can say it with words, so I’ll do it with a kiss. Happy birthday! 38. All I’ve ever wanted was for you to be happy. To smile and laugh and be content. I hope you can say that you truly feel that way, because you deserve it. Happy birthday! 39. You aren’t just my mom, you’re my best friend. You’ve always been there my side, looking out for me. I can’t thank you enough for that. Happy birthday! 40. You’ve done more than raise. You taught me to be strong, to be smart, to be independent. You taught what it’s like to be a powerful woman. I can’t thank you enough. Happy birthday! 41. Thank you for always being there for me, for giving me warm hugs and big kisses. You’ve always been in my corner. Happy birthday! 42. From day one, you took care of me, loved me, and made me feel so secure and happy. No one else could have done that for me. No one could ever make me feel that way. Thank you, mom. Happy birthday! 43. Moms do more than look after their children. They provide guidance and love and care. You went above and behind and still do to this day. I appreciate it so much. Happy birthday! 44. I’ve been so blessed to have you in my life. You brought me into this world and have done your best to care for me, love me, and nurture me. Happy birthday! 45. Mom, you’ve always believed in me, even when you knew I was making mistakes. You always let me live my life how I wanted, because you just wanted me to be happy. I want the same for you. Happy birthday! 46. You’ve always been such a devoted person. To the people around you, but especially your children. You show me such love and care that I can’t believe it sometimes. Thank you so much. Happy birthday! 47. Sometimes I feel like I’m not the best daughter, that I don’t do enough to make you happy. But you’ve still always shown me love and kindness and gratitude. Thank you for your loving way. Happy birthday! 48. All I can say is that I love you. I love you and everything about you. You’re the best mother in the world, and I hope one day I can be like you. Happy birthday! 49. I couldn’t ask for a better mother. You’ve always given me everything I could ask for in a parent. Thank you so much. Happy birthday! 50. Mom, you’re my best friend and one true love. You still teach me so much about being a woman, a mother, and a daughter. I’m so thankful to have you in my life. Love you mom. Happy birthday! 51. My lovely mom, today you’re celebrating another year of your life and I’m so happy for you. You’re my inspiration and I want to be like you. Thanks for all the support and love. Happy birthday mom! Enjoy a lot! 52. 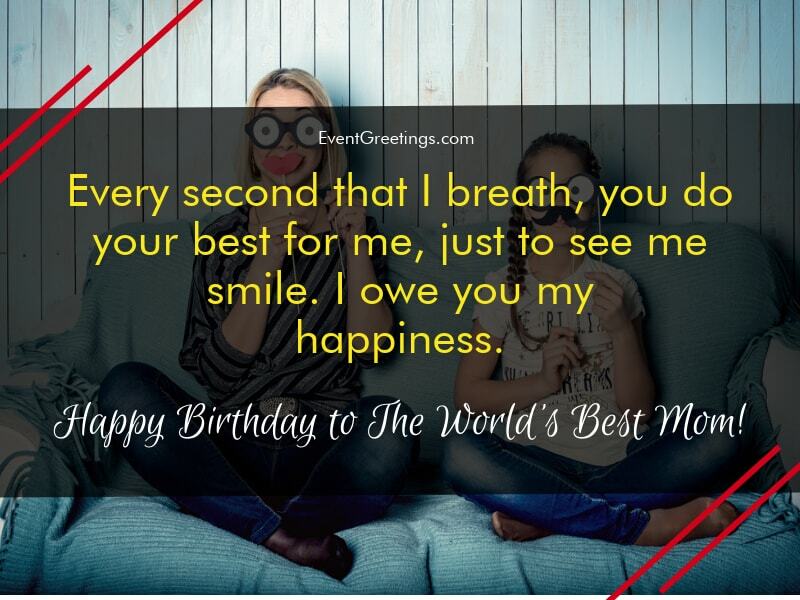 Today is one of the best most important days because it’s your birthday mom. Happy birthday! You are the best mom, the best guide and my best friend. I can never explain the love I feel for you. Always be very happy and keep smiling! 53. The most beautiful woman, happy birthday! I will never forget your sacrifices and dedication for me. I’m really lucky to be born from your womb and want to be your daughter in every life. May God grant you with many years of life and give you all the best things in life! Love you! 54. Happy birthday, my protector, my warrior mom! Your spirit, courage always inspired me. You’re like the light who spreads only the happiness in everyone’s life. May the Almighty give you all the strength and power so that you can always win! Have a beautiful day! 55. The most awaited day has come. Happy birthday, sweet mom! I’m so thankful to God for making me your daughter. You’re my true friend with whom I can share all my feelings. Thanks for being so lovely mother. Best wishes for your life! 56. The person I love the most is you, mom. We have the most beautiful relationship in the world. You’re the very special part of my life without which I’m nothing. Happy birthday to the best mom! 57. Dear mom, you didn’t give birth to me, but always considered me as your own child. You never differentiate me from my siblings. I’m really blessed that God has sent me to you. Happy birthday, mom! Love you a lot! 58. Today you’ve completed another year of your life, mom. My heartiest congratulations to you. Wish you a wonderful and blessed life forever! 59. Happy birthday, mom! You’ve raised me with much love and care. Whatever I’m today, is all because of you. Thanks for everything and I promise I’ll make you feel proud. May this day come repeatedly in your life! 60. Don’t think that you’re getting older, because you’re my evergreen mom with a lot of youthful spirits. All the love for you, mom. Wish you a very happy birthday! 61. The most pure-hearted woman, happy birthday! Mom, you’re the perfect figure for the womanhood. I’m proud to have you in my life. You deserve all the love and happiness of the world. Love you! 62. Dear mom, your existence is fundamental for me because I’m incomplete without you. Always be by my side in every situation. The best mom, happy birthday! Stay blessed and be happy today and always. 63. The person who always being there for me is you. I can’t ever forget your unconditional love. Happy birthday, mom! May God keep you healthy and fit and give you the eternal happiness! 64. 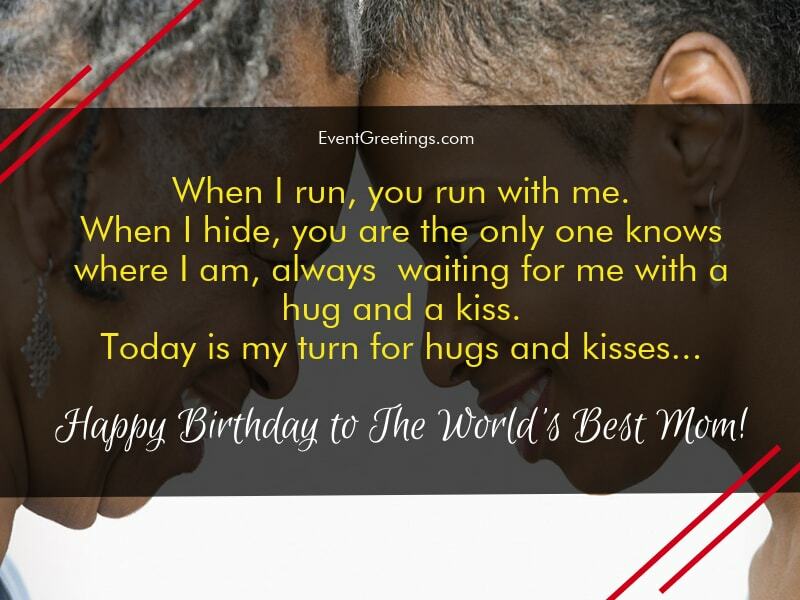 Today is one of the happiest days of my life because I’m here with you to celebrate your 50th birthday! Congratulations mom, you’ve done a great job during these years and deserve only the good things in life. Best wishes mom! Enjoy much and make this day an unforgettable one! 65. I know, I’m not the best daughter but you’re the best mom in the whole universe. 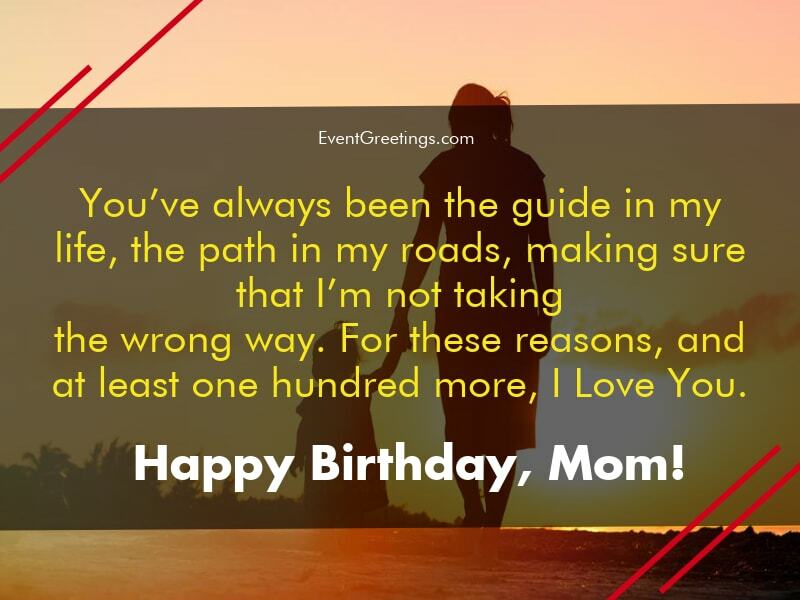 Many many happy returns of the day, mom! Always enjoy your life and keep smiling!